Hard Hat Color Code - What Do Hard Hat Colors Mean? You are here: Home / Tips / What Hard Hat Color Do You Need on Your Job Site? What Hard Hat Color Do You Need on Your Job Site? Active work sites can be busy and potentially dangerous places. Hard hats are designed to comfortably protect a worker’s head, and they can go a long way toward helping reduce workplace injuries. Hard hats come in such a wide variety of colors that choosing the best one for your work site can feel a little overwhelming. However, there are some generally-accepted industry standards that can help you provide a safer, more organized work environment that is consistent with many other job sites. Here is some information about the federal standards currently in place, what certain hard hat colors commonly represent and why you may want to consider color-coding your workplace. The Occupational Health and Safety Administration (OSHA) implemented industry-wide guidelines for hard hats in the 1970s. Workers are required to wear protective headgear in any work environment that presents the possibility of high-heat burns, electrical injuries, falling or flying objects and irregular or moving surfaces that could cause an impact injury. While OSHA provides clear guidelines for which types of jobs require a hard hat, they do not mandate which colors you should use for specific worker roles. First patented by Bullard in 1919, one of the earliest versions of a true hard hat came in a single color: black. The color options for modern safety headgear have grown significantly, and many colors are available in various shades. Although there are variances within certain industries or job sites, here are the generally-accepted meanings of some common hard hat colors. Often easy to spot in a sea of other colors, white hard hats are usually worn by anyone in a supervisory position, including managers, architects, engineers and foremen. Typically worn by your site’s safety officers or inspectors, new hires and trainees can also wear green. Workers who operate any heavy machinery or earth movers often wear yellow, as well as employees doing general construction labor. Workers who do any form of welding or other high-heat jobs typically wear brown. Due to its high visibility, most road construction workers wear orange hats. They can also be given to new hires and site visitors. Electricians and carpenters frequently wear blue hats. Interim workers and employees in a technical advisory role can also wear blue. Firefighters other employees with emergency training often wear red hats. These are most often issued to visitors on the work site. 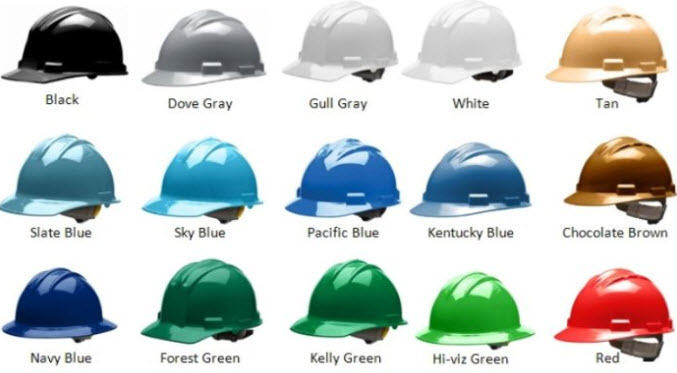 Since there are no federal or state rules that govern what each hard hat color signifies, you are free to choose any color of safety headgear you wish for your work site. However, while you will not be breaking any laws or be looking at a paying a fine if you decide to give all your employees the same color, there are several good reasons you may want to consider having a designated color-coding system. A specific color for each type of job can make it easier to quickly identify key people in the event of an emergency. A color-coding system can help streamline the workday by making it easier for your employees to find a specific person if they have a question. A supervisor can tell at a glance where certain groups of employees are working on the job site. Role-specific colors are the standard at most job sites, and following the generally-accepted rules can help provide continuity. Always purchase safety headgear in your desired colors from the manufacturer. Paint or other colorants contain chemicals that could weaken or damage the hard hat’s outer shell and could potentially lead to workplace injuries. Never use these types of products to obtain the color you want. Using a color-coded system has the potential to make your job site run more smoothly and can even make the work environment safer. Following the typical industry standards can be a good place to start when implementing your own color-coding plan. However, the most important factor to consider when choosing safety headgear is quality construction and whether the product model fits the specific type of work your employees will perform. Even if a hard hat is the right color for a job, it is still the wrong choice if it is not made of the proper material or if it does not have the right safety features. Be sure to consult OSHA guidelines to determine the recommended styles for the specific tasks your employees will be doing, then order the appropriate safety headgear in your desired colors. Hard hats have significantly improved the safety of potentially dangerous work environments over the last century. Even though color will never be more important than quality construction and safety features, the wide array of color choices available should make it easier for you to find the proper features in the color that is best for your job site.